It’s all been coming down to this moment. The NBA Finals. All the storylines will come to an end with each team looking to capture the Larry O’Brien trophy with just 4 more wins. 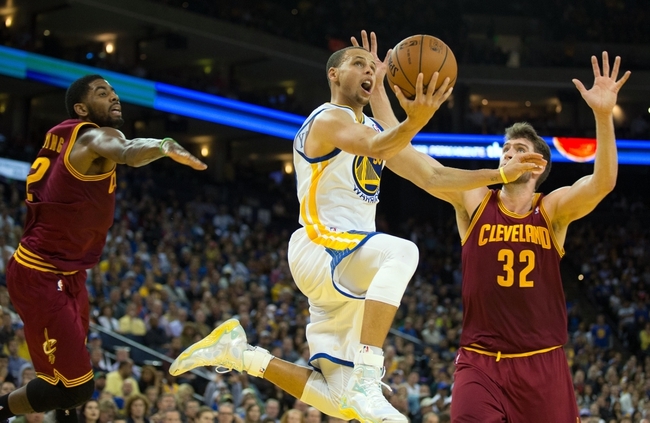 The Golden State Warriors are looking for their first title in over 30 years, and the Cleveland Cavaliers are looking for their first one ever. We have the most entertaining and best team by record for the entire NBA season against the best player in the world. The Cavs have had to go through multiple injuries throughout this years playoffs but still have managed to come out on top in the East; all because of one player by the name of LeBron James. With Love completely out of the picture, they’ve had Tristan Thompson step up and make plenty of noise this postseason. Thompson’s offensive rebounding has sparked the Cavs and it looks like Cleveland could be even better than before if Kyrie can get back to 100%. Kyrie will have to be huge for the Cavs to have a chance against their opponents. The Warriors have looked like the best team in the league all season long and that includes the postseason. Outside of two losses, (that have only helped the Warriors) they have steamrolled through all of their competition so far. Curry has been nothing short of spectacular this postseason, and Kerr has proven time and time again of how great of a coach he has the potential to be. Cleveland has to be perfect in this series. The Warriors are just too good at too many things for Cleveland to be anything but perfect in this series. Thompson needs to destroy on the offensive boards because that could cause Golden State to rotate out of their small lineup quickly. A lineup that has taken out many teams quickly. Next, someone has to help LeBron. LeBron is going to have Draymond Green, Harrison Barnes, Shaun Livingston, Klay Thompson, and Andre Iguadala all rotating on him. This series is going to be hell for LeBron with all those guys guarding him, so someone somewhere has to step up and help releive the pressure off the man. If they don’t, the series could look very similar to the prior Finals of 2007 or 2014. This is Kyrie’s time to shine. The focus will be 100% on LeBron and this is when this man should be earning his paycheck. Golden State has tremendous defense all around, but it’s going to be centered on LeBron and Kyrie HAS to take advantage of that. If Cleveland is to have a chance Kyrie has to step up and score big time buckets for them. JR Smith can be ridiculously good and ridiculously bad as most know. If he gets hot he can match some of the 3pt shooting on Golden State, but if he’s off he’ll shoot his team out of the game really quick. Cleveland fans are hoping for the former because if you have JR being efficient, LeBron doing his thing, and Kyrie taking advantage of his opportunities, then that’s a recipe for success. In game 1 of the Eastern Conference Finals, we saw just how bad ISO ball can get in Cleveland. If they fall back on that like they do so often, then the Cavs simply won’t win. A solution? Move the ball. LeBron needs to do what he does best and that’s penetrate and kick to the open guy. If they fall back on running an ISO offense late in games, then the team will fall apart. The Warriors are going against a tall task. Playing against LeBron James. Only 2 teams in the last 5 years have been able to beat him, and both times they were the championship winning teams those years. If the Warriors truly want to win, they will have to go through LeBron to do so. The Warriors need to rotate defenders on LeBron constantly. Never give him the same look and get fresh bodies that are able to at least give him trouble. Steph Curry needs to continue what he’s done all postseason. Pick his spots, don’t force anything, and continue to be the vocal leader of this machine. If Curry can continue doing so, then the Cavs won’t have an answer for him. He’s too quick around screens, has the fastest release in the league, and his handles are on par with Kyrie’s. The lineup situation will be very interesting. Tristan Thompson should be able to trounce the small lineup with his offensive rebounding, but Cleveland likes to fall on a small lineup of their own with LeBron at the 4. This will be a chess match between coaches and Kerr has won those all season long. Kerr cannot be anything less than what he’s been all season long which is one step ahead of the competition in preparing his team for what they must face. Klay Thompson has to get his offense going. He was able to get through the Rockets without being needed to score too much, but this is the Finals. Klay has to hit his shots for the Warriors to be comfortable. To make things easier on Steph, Klay’s scoring efficiency is a must. Prediction: Curry raises the trophy for Golden State after beating LeBron and the Cavs 4-1. The Warriors as an entire organization are on a completely different level right now. From the front office all the way down to the players; the Warriors are a beat above all their competition. I believe in the end, ISO ball will kill the Cavs while the Warriors thrive off of ridiculous Steph shots and precise ball movement. Regardless of what happens in this series, this is a successful season for both franchises as they both have gone farther than they were suppose to. We should all be entertained by these two superstars, LeBron and Steph, engaging in amazing basketball for the trophy. You can see the other writer’s predictions below. Ryan Fort: Warriors 4-1 but if Kyrie is 100% Cavs in 6. Ever since he was drafted Steph Curry has been proving doubters wrong. His first couple of seasons in the league were filled with ankle injuries, thus sparking the ”what if he was healthy,” line. We’re seeing right now what the answer to that quote would be as Curry is tearing the league up. He’s already in the debate for best shooter ever and he’s arguably the best point guard in basketball. This season alone has seen Curry put the Warriors in elite category. They’re arguably the best team on both ends of the court and only seem to be getting better in each game. In just his third year being a pro Anthony Davis has already led a team to the playoffs. Playing in a small market Davis hasn’t really gotten the recognition he deserves in regards to him being deemed an elite player. He’s in the conversation for MVP as well as Defensive Player of The Year. Both teams have been a surprise this season. No expected the Warriors to make the huge leap they did going from Mark Jackson to Steve Kerr as coach. Not too many outside of the city of New Orleans saw Anthony Davis leading a Pelicans team to nearly 50wins and a playoff berth with Monty Williams as head coach. The Warriors won the season series 3-1 winning the games played at home by an average margin of 21.5 points. When playing in New Orleans the Warriors won a game by six points (OT was needed) and lost by three points in the other game. The Warriors have to continue playing the way they have been. Thompson and Curry should be able to light up the Pelicans back court and stifle Anthony Davis down low (Bogut must remain healthy). G’State also has arguably the best bench in basketball having guys like Igudola, David Lee, Barbosa and Shaun Livingston coming in and maintaining/expanding leads of their own. This team is ultra deep and they should be able to use that to their advantage. The Pelicans are nice young feisty team that possesses a ton of talent. (A coaching change could bring out the best in Holiday, Evans and potentially Gordon.) They can run the floor and they have floor spacers in Ryan Anderson & Quincy Pondexter who come off the bench. To have a chance against Golden State the Pelicans have control the tempo of the game and they have to make things rough on Stephen Curry. If Davis can dominate down low and Holiday contains Curry to an extent the Pelicans have a shot. Tyreke Evans also has to be productive as well. 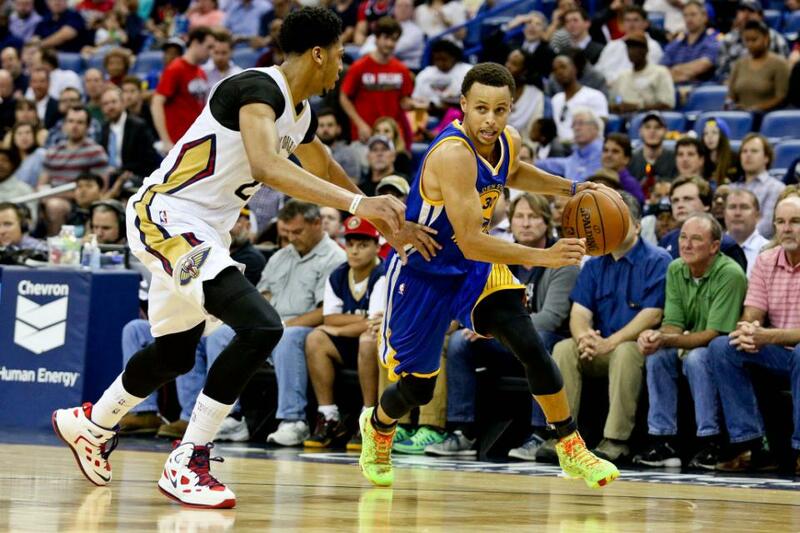 Prediction Warriors beat the Pelicans 4-2. G’State will win a couple of games by a large margin, but with that being said I’m expecting Anthony Davis to have a Curry like coming out party (few years back against Denver) and dominate one to two games. Tyreke Evans will also be essential in the Pelicans claiming a 2nd victory in this series. The talent gap isn’t too far apart when describing the starting lineups. It’s the bench that’ll kill N.O. 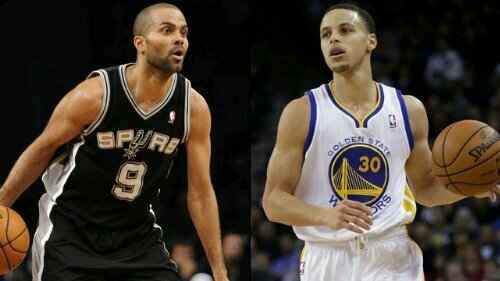 Spurs vs Warriors; Parker vs Curry; Ginobli vs the Warriors’ bench; Pop vs Jackson; Barnes vs Leonard! What’s not to love about this upcoming series? This series features an up and coming team that plays a fast past game and an older more experienced team that plays defense while scoring at a high chip. Going into the previous series, I had the Spurs being upset by the Lakers, because they weren’t fully healthy and weren’t playing at the same level they played at during the earlier part of the season. While they dismantled a depleted Lakers squad I noticed two things. The first thing is that they’re getting healthier after each game. And the second thing is that their offense is nearly unguardable. Against the Lakers, San Antonio used the pick n roll to get easy buckets, posted Tim Duncan up to get an inside presence and set off ball screens to free up their shooters. After each possession they would switch it up to keep the opposing defense off balance. That’s why their offense is so fluid and unpredictable. On the defensive side of the ball San Antonio can defend the low block area well. If they could make it tough on two allstar 7fters imagine how hard it would be for bigs their size to score. Even with K.Leonard the Spurs’ perimeter defense is a bit shaky. The Lakers were able to get the shots they wanted, but weren’t able to knock them down which gave San Antonio’s defense a chance to make it harder on the bigs inside. All in all the Spurs can defend the paint, but will struggle against a team that can knock down shots consistently. The Warriors, on the other hand, is a team no one, (besides me,) picked to be in this situation. Everyone had them bowing out to the “contending” Denver Nuggets. What people didn’t realize is that the Warriors and Nuggets play the same game. The only difference is that Golden State is a better 3pt shooting team. People also forgot the Warriors had the best player in that series. The Warriors aren’t that good defensively. And once the Warriors are hot all bets are off. The Warriors are easily the best 3pt shooting team in the Playoffs and one of the lesser defensive teams. In every game, the Warriors defense looked nonexistent. They would constantly get beat off the dribble and give up easy looks at the rim. When playing a team like the Spurs that’ll spell doom. On the offensive side of the ball the Warriors are dangerous if they get hot. They boast the best 3pt shooting backcourt and have a solid frontline that can produce just enough buckets. With David Lee ailing, they’ll have to rely on the 3pt shot more, because their bigs won’t be able to get much against the Spurs. Having the best guard in this series might not be enough for the Warriors in this series. The Spurs will get buckets at will, unless their defense steps up (with Bogut getting healthier that should help.) 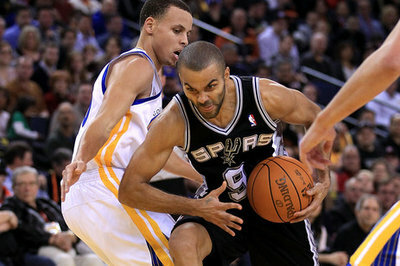 San Antonio’s perimeter defense will have to defend the three better or else this series could be the end. But then again their offense should be enough to propel them to the Western Conference Finals…… My heart wants to say the Warriors, but my head is saying Spurs.